Cohort Finalizing NOW: We Start on Saturday, This Upcoming Weekend! And, When Your Soul Just Yearns For The Next Step In Your Evolution. Using visuals to assist deep reflection work in individuals is my passion. 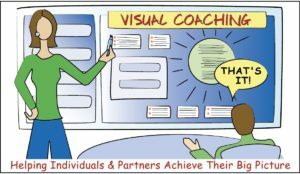 For 15 years, as a pioneering Visual Coach, and now with the able camaraderie of our tribe of Certified Visual Coaches, we’ve coached 1000s of individuals across the globe to shift their professional and personal crossroads for the better. 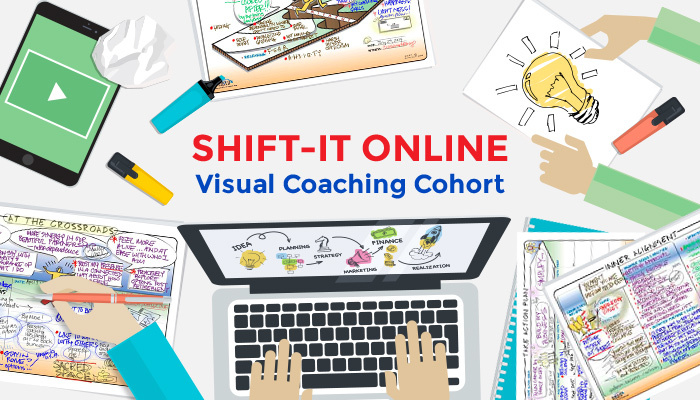 During your participation in SHIFT-IT Online, you gather with like-hearted people around the world via web conferencing. This poignant experience guides you to literally draw your past, present and desired future. To identify and bust through resistance. And to move into aligned action. 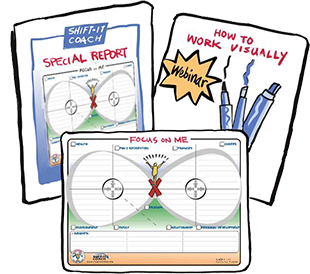 Yes, it’s a visual approach — we use 14 Visual Maps over the course of the program. If you are artistic and have visual skills already, great, you’ll be right at home. If you aren’t an artist, don’t worry, you’ll learn by being around some of us who are. And, it really doesn’t matter what your maps aesthetically look like, as underneath this work is really about focus and energy. Writing (whether you use a pen or stylus) is a focusing tool. The act of creating these maps slows your attention and focus down to human speed. So you can hear those whispers inside of you and connect more deeply with them! If you’ve participated in any of my other online programs you know how easy it is. We use a handy web conferencing tool to connect each Saturday. There’s also an online forum where we collaborate and share our maps and other resources. 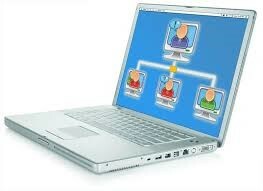 And all materials and recordings are centrally stored on our SHIFT-IT School site for easy access. You get immediate access upon registration. Since this program was just in our recent New Years event, we’ve extended the coupons. Just enter into coupon field when registering via the link below. P.S. Dates don’t work for you? This program is fully recorded, so if you can’t make all the dates live, don’t worry, you can easily follow along via the recordings (available in both video and mp3). Alternatively, see The SHIFT-IT Home Retreat Kit for a solo option you can complete at your own pace. P.P.S. 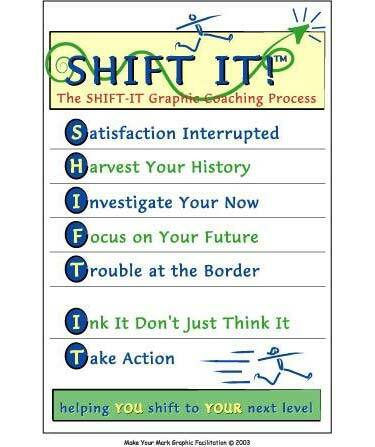 Have you done SHIFT-IT before? Ready for your next round of manifestations? Come as my guest, via the REPEATER OPTION (just write us for the coupon code to use when registering online). P.P.P.S. Are you on my list because of an interest in working visually? FYI, this season we have two upcoming Fundamentals of Working Visually classes (online and in-person). 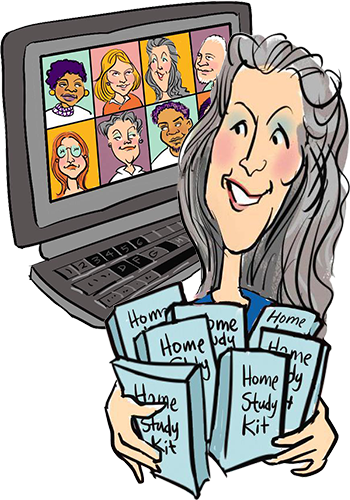 Home Study Kit also available: Click here. P.P.P.P.S. For a full roster of 2018 classes, products and private coaching and training click here.